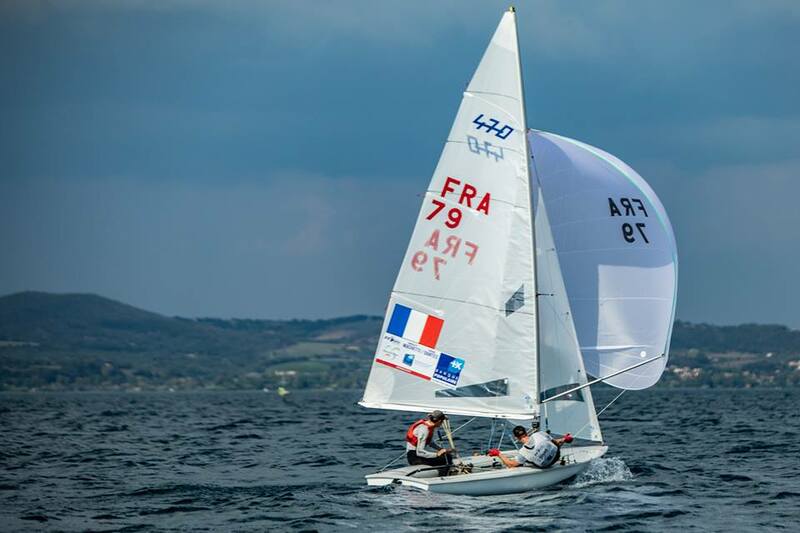 French team of Hippolyte MACHETTI/Sidoine DANTÈS successfully defended their Junior World title throughout the week and Italians Benedetta DI SALLE/Alessandra DUBBINI claimed their second 470 Junior World Championship after 2015 Junior Worlds victory in Thessaloniki, Greece. 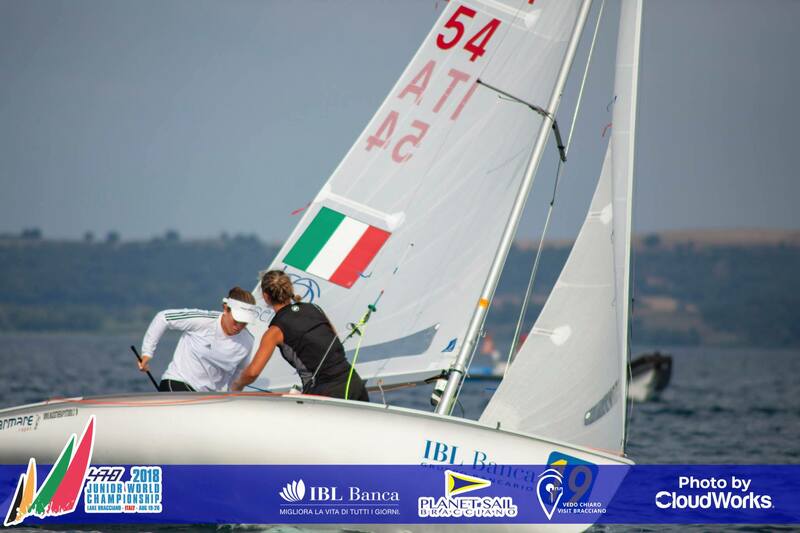 Sunday, Aug 26th was the last day of racing for 470 class Junior World Championship at Lake Bracciano, Italy and sailors started their morning boat preparation under a cloudy sky. 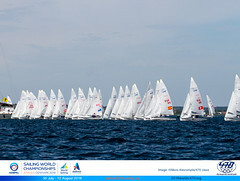 At 11:00 am all teams were on the water enjoying a nice south/east wind of 9-12 knots. Anticipation was building up for the crews as the Committee was preparing the race course for the last two races of the championship. 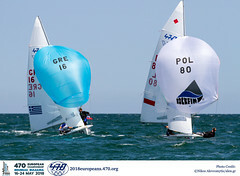 The morning races for the Gold fleet, Women’s and Silver fleet were concluded with the wind intensity slowly fading towards the finish line to 2 knots. At the end of these races, all sailors were sent back to shore as it was time for the medal races. 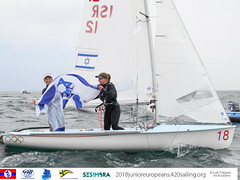 Women’s medal race was scheduled for 13:00, but once more the unsteady wind conditions and a storm that was approaching fast, delayed the start for almost two hours. Women’s medal race finally started with westerly light winds but unfortunately at the second gate, just before the finish line, November flag was hoisted and race was abandoned as the time limit was over. With just only 45 minutes of possibility of completing a race, Women’s fleet was sent back as it was the time for Men’s medal race. Nevertheless, the hope for starting the medal race for Men’s fleet died out as the wind was nowhere to be found. Therefore, no medal races were sailed for any of the fleets and results of previous races remained unchanged. 3. Paola AMAR and Marine RIOU, FRA 19. A great week with hard conditions, a lot of waiting time but also with adrenaline, was concluded in the best of ways with the closing and award ceremony, pasta party and many new friendships. Everyone’s hope is that the next Junior World event in 2019 will host more young sailors ! We wish to extend a huge thank you to all the people who allowed this incredible event to successfully take place, from the staff members of Planet Sail Bracciano yacht club, Race and Jury committee, the International 470 Class Association represented by its President Mr. Dimitris Dimou and all the athletes, coaches, families and friends who came from far away for support.